How many stitches, indeed? “Beyond the Pale” contains hundreds, thousands of stitches, which—when seen as a whole—form an amazing tapestry of life and love, sorrow and loss. The scope of this book defies what any three other novels combined offer, and it puts them all in just over 300 exquisitely crafted pages. “Beyond the Pale” starts toward the end of the 1800’s in a small Russian village. Rabbi Isaac Meyer’s wife, Miriam, is going through a difficult labor. The baby is coming out feet-first. The midwife, Gutke, is wise and experienced, and gets the infant girl delivered safely. Her parents name her Chava. Gutke has a sort of gift, where she catches glimpses of a newborn’s future life. She doesn’t always share her visions, for some of them are indeed unpleasant. For Chava, crying out healthy and strong, she sees a long, difficult journey, which she will face with courage and loyalty. 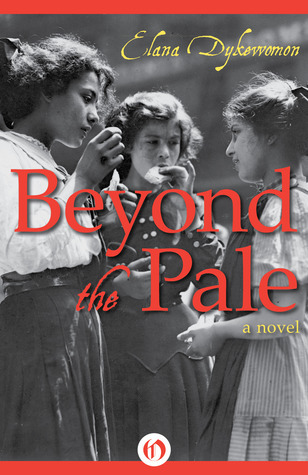 “Beyond the Pale” shows us Gutke’s background—how she came into her gift, and how she apprenticed as a midwife—then follows Chava’s journey forward. There are indeed tough times for the young girl. At fourteen, she moves to America with her family, and starts working almost immediately for $3 a week. As she grows through her teen years, she works different jobs—as do all her family members—but there’s never enough money to move out of their cold water tenement. Two bedrooms—far more than two bodies. Times are hard for new immigrants, doubly or trebly so for Jewish immigrants. The Russian pogroms were replaced by a not-very-subtle anti-Semitism among “American-borns” in New York. For Chava, the New World is a harsh teacher, but she finds inner-strength from her family, her work, the burgeoning labor movement, and—especially—from the girl who became the love of her life. “Beyond the Pale” covers so much time and so many experiences, but not once does it seem forced or dragging. The pacing here is perfect. So, too, is watching the different plot strands weave together like challah dough, then become something whole, beautiful and perfect. There is heartache in this story—Chava suffers her share and more—but she finds satisfaction as she tests her inner-strength. Elana Dykewomon’s command of both language and storytelling is near-flawless. There isn’t one misstep in this entire novel. Everything has its purpose and place; everything advances the story or supports it. Survival can be plenty tough on its own. Add Chava’s involvement in labor organization and her then-unaccepted Lesbian love, and you will be wrung-dry emotionally by the time you finish. In context, this alludes to the onions and garlic at the core of most traditional dishes they cook. In aggregate, it serves as the perfect metaphor for “Beyond the Pale,” with Chava shedding layer after layer, getting closer to her core-being, to the strong woman who will fulfill her destiny. This entry was posted in Best Books of the Year, Books, LGBT, Literary or Genre Fiction and tagged Beyond the Pale, booksandmoviesandcrap.com, Elana Dykewomon. Bookmark the permalink. I reserve the right to hate the author’s last name, however. I understand. I believe she lives in Oakland, if you want to go kick her in the shin. What an awesome book, though. Oy vey.